Want to kick your health into high gear? 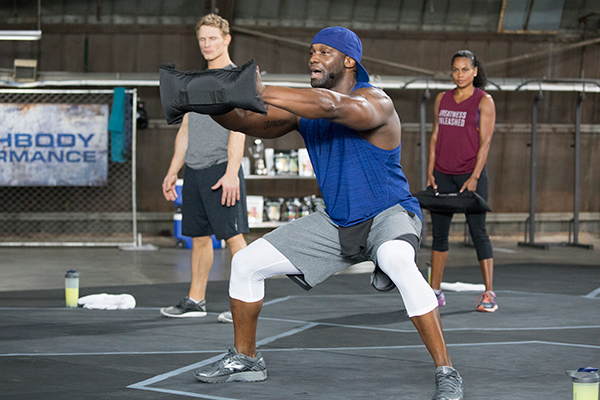 Beachbody Super Trainer Chris Downing has you covered. He’s the creator of SHIFT SHOP, a program filled with high-energy workouts and a targeted nutrition plan that will help produce incredible results in just 3 weeks. The benefits of The SHIFT SHOP are many, but the best part is that it’s designed for people of any age, weight, or fitness level who want to take charge of their health. Pro tip: Chris is he’s bringing you four brand-new workouts to take the “shift” to a whole new level. You’ll still use Chris’ breakthrough “ramp-up” method of increasing your daily workout by 10 minutes every week, but this time we’ve added a Prep Week and new workouts designed to test your speed and strength as you get faster and stronger. If you’re ready to make the shift, mark these dates on your calendars! October 1, 2018: New SHIFT SHOP Challenge Packs and Accessories Bundles available on TeamBeachbody.com, plus the two new Quick Shift workouts on Beachbody On Demand. October 22, 2018: The two new Proving Grounds workouts available on Beachbody On Demand. A 3-week ramp-up fitness program consisting of strength and cardio workouts, and an easy-to-follow nutrition plan. With the ramp-up method, the workouts become longer and more challenging each week, and the exercises also become more complex, Friedman explains. “By regularly increasing the length of the workouts and changing the way your body moves, you can prevent a plateau and get the best results,” Friedman says. This strategy also helps beginners ease into the program while still challenging more advanced exercisers. Another feature that sets SHIFT SHOP apart is its signature agility markers — four colored hexagon pads that serve as directional targets during cardio workouts. And of course, when you’re doing 3 weeks of intense exercise, you’ll want to properly fuel your body, which is why the program also includes a comprehensive nutrition plan to maximize your results. “This is an elite functional fitness program designed for everyone,” Friedman says. In other words, the program works whether you’re an advanced athlete, former athlete, average gym-goer, or total fitness newbie. A main benefit of SHIFT SHOP is how great it is for sports training, Downing says. “This is largely because so many of [the workouts] include speed and agility movements, as well as the explosive movements like plyometrics,” he explains. Every sport requires a certain degree of coordination. But for sports like football, soccer, track, tennis, and boxing — all of which require efficient biomechanics — coordination is key. SHIFT SHOP delivers plenty of exercises that help hone this skill, such as cross jacks (a more complicated version of jumping jacks). This move, found in Speed: 35, requires you to jump between three agility markers, crossing your feet each time you jump between them. By challenging your footwork and your mind, this is an excellent move to improve coordination, Downing says. In addition to coordination, the cardio workouts of SHIFT SHOP also test your agility thanks to the aptly named agility markers. During certain exercises, Downing calls out a command, signaling you to touch a specific marker by running, twisting, or jumping to it. This helps you sharpen your reflexes and multidirectional speed and power. One of the agility exercises in the program is the lateral slide, found in Speed: 35. “The key to this move is to stay low, move on the balls of your feet, and be ready for quick directional changes,” Friedman explains. Picture yourself in a crouched position, legs wide, knees bent, shuffling around the markers. When Chris tells you to “shift,” you tap a marker and switch directions. 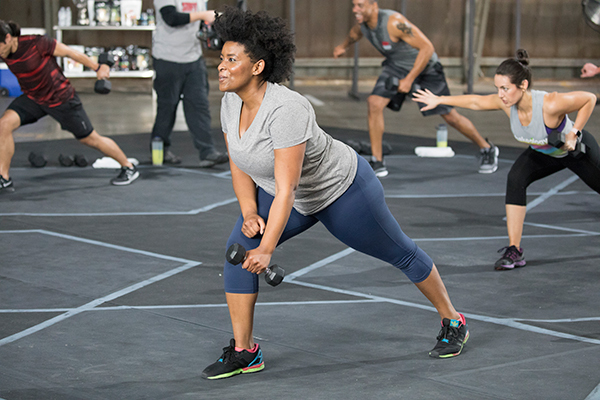 The nature of The SHIFT SHOP program — alternating between high-energy cardio and strength exercises throughout the week — is designed to build both cardiovascular and muscular endurance. By repeatedly performing exercises for up to 60 seconds, you have to muster both kinds of endurance to make it through the round. Fast fences, found in Speed: 45, is a prime example of a challenging endurance move. “With your agility markers in a line, hurdle laterally over each marker, lifting both feet high enough to clear an imaginary fence, and swing your arms for momentum,” Friedman says. “You’ll see this used a lot for football and soccer drills,” she explains. Doing this move for an entire minute is sure to put anyone’s endurance to the test. Many of the exercises in SHIFT SHOP are geared toward improving reaction time, something that’s hugely helpful for sports like tennis, baseball, basketball, soccer, and sprinting. Just look at Chop Shop, from Speed: 35: While standing in the center of a triangle (each corner is a different color), do high knees and pump your arms as fast as you can. When Downing calls out a specific color, you have to quickly turn toward the marker, turn back to center, and then continue with your high knees. This tests you mentally and physically by challenging your ability to quickly translate what you hear to how your body moves. “The strength component in The SHIFT SHOP taps into every muscle group to help you gain muscle and get stronger,” Friedman says. The strength exercises start out simple, then gradually increase in difficulty and complexity as the weeks progress. Along the way, Downing continually coaches you on proper form, which is key for results and thoroughly explains the benefits of each exercise and the areas it targets. Your core is targeted constantly in The SHIFT SHOP. Core strength is key for sports like surfing, gymnastics, volleyball, soccer, swimming, and running, but it’s also an important component of overall fitness. “A strong core benefits everything you do,” Friedman says, such as good posture, walking, and lifting grocery bags. Bear dog is one of the many exercises that help strengthen your core in SHIFT SHOP, Friedman says. Begin in a bear stance with your hands under your shoulders and your knees bent 90 degrees below your hips (don’t let them touch the ground). Raise your right arm and left leg, and hold for a second. Lower and repeat, this time raising your left arm and right leg. Continue switching sides each rep. If you’re having trouble visualizing the move, think of a classic table pose in yoga modified so your knees are off the ground. On top of the physical results you’ll see from The SHIFT SHOP, you’ll also walk away with a newfound sense of mental fortitude, thanks in part to Downing’s energetic, motivational approach to training. “If you want to be challenged, Chris Downing will call you out and challenge you to the max,” Friedman says. It only takes 3 weeks in the Shop to create an incredible mental shift. “You’ll learn discipline, you’ll push yourself past limits you never thought you [could], and you’ll feel amazing at the end of it all, both physically and mentally,” Friedman says. The SHIFT SHOP nutrition plan promotes a balanced combination of lean protein, vegetables, and healthy fats, and it gradually helps you remove starchy carbs from your diet, explains Paige Benté, M.S., R.D. The first week includes a limited list of approved starchy carbs, with a focus on legumes and tubers (aka beans and potatoes), she explains. The second week eliminates legumes, and the third week says goodbye to all starchy carbs. This helps lean out your body by reducing your glycogen stores. Not only are you getting the physical benefits of nourishing your body with whole foods, but you’ll also learn a lot. Spending 3 weeks on a meal plan that prioritizes veggies and protein can help you better understand how your body reacts to starchy carbs, and retrain how your brain thinks about carbs. “While [carbs] are a very important part of the diet, many people become too heavily reliant on them,” Benté says. One of the many benefits of SHIFT SHOP is that it helps you shift your mindset to rely less on carbs and comfort food, and focus more on veggies and lean protein to fuel your body. A nice side effect of The SHIFT SHOP is that it can help you slim down. The SHIFT SHOP meal plan helps you wean off of starchy carbs (which people often consume in excess) and double down on lean protein and veggies. This gives your body enough of the kind of food it really needs while eliminating foods that are more decadent and tend to prohibit weight loss. By the end of the 3 weeks, you’ll be eating more healthfully, which is a key part of achieving maximum weight-loss results. Check out how these people slimmed down and transformed their bodies! Another benefit of The SHIFT SHOP is that you can easily fit it into your schedule, no matter how busy you are. Each workout takes just 25 to 45 minutes and can be done whenever you want from the comfort of your home. That’s right, no need to waste time driving to a gym. The nutrition plan is easy to follow, too. It requires no special cooking equipment and relies on simple, accessible ingredients. You don’t have to carve out time to whip up elaborate meals or shop for obscure foods — The SHIFT SHOP is all about simple nutrition. To get your shift on, you can purchase the SHIFT SHOP program on DVD or sign up for Beachbody On Demand, which lets you stream the workouts from any device connected to WiFi. With your membership, you’ll also get access to Beachbody’s premier cooking show, FIXATE, as well as over 45 exclusive fitness and nutrition programs designed by top trainers.